Ever since the beginning of June, we have been covering various UI enhancements and features included in Microsoft’s upcoming Windows 8 OS. If you have been patiently waiting to get the best eye candy features of the next version of Windows in Windows 7, then your moment has arrived. Even though it’s too early to say anything about the Windows 8 UI, official Windows 8 preview video and leaked screenshots of pre-beta builds have given enough information about the next version of Windows. 1. Windows 8 Boot screen for Windows 7: The recently leaked Windows 8 build 7989 includes beautiful “Betta Fish” boot screen. 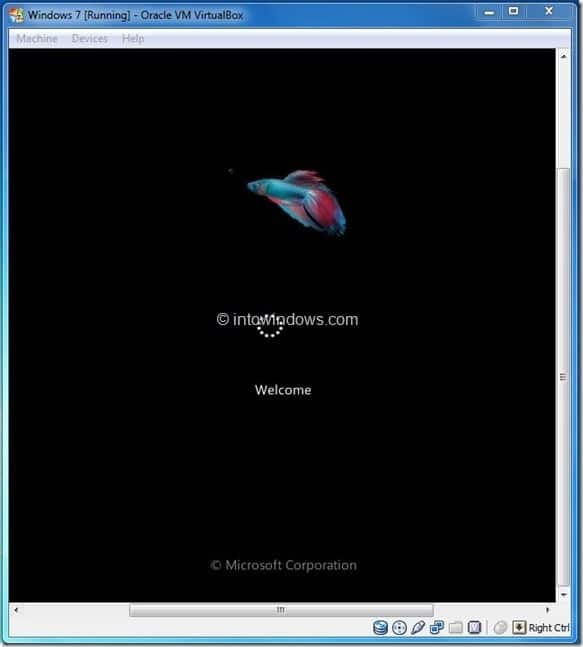 Follow our Windows 8 boot screen for Windows 7 guide to know how to apply the new Betta Fish boot screen in Windows 7. 2. Windows 8 Start screen for Windows 7: If you have been following Into Windows, you probably know about the new Start screen with live tiles. You can get the exact same feature in Windows 7 as well with the help of Rainmeter software and Omnimo skin for Rainmeter. Read our Windows 8 Start screen for Windows 7 guide for instructions to install and enable Omnimo skin. 3. Windows 8 taskbar user tile picture for Windows 7: Another new feature of Windows 8 which lets you access user settings right from the taskbar. Get Windows 8 taskbar user tile picture in Windows 7 using Taskbar User Tile program. 4. Logon screen date and time for Windows 7: Windows 8 logon screen displays date and time as well. If you want to place date and time on Windows 7 logon screen, date and clock for Windows 7 logon screen is the guide you need to follow. 5. 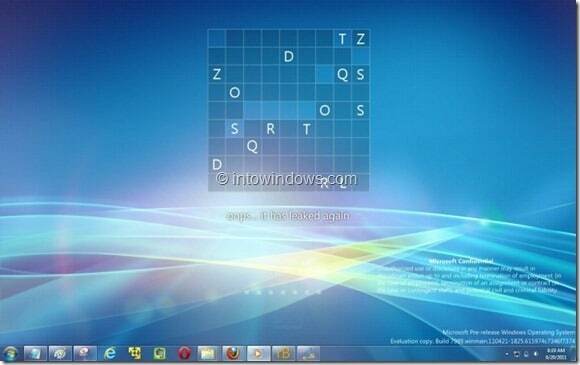 Windows 8 desktop watermark for Windows 7: Well, this is not a feature! If you have seen any leaked screenshots of Windows 8 desktop, you probably have noticed Microsoft Confidential and build tag watermark on the bottom right of the desktop. Refer our Windows 8 desktop watermark for Windows 7 guide to add the exact watermark with the help of Rainmeter skin. 6. Windows 8 Sidebar menu for Windows 7: Along with Windows 8 Start screen, Microsoft also showed off the new sidebar menu in Windows 8 which lets you access various settings and also allows you quickly move back to Start screen. 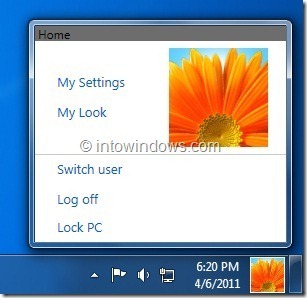 Get this feature in Windows 7 by following our Windows 8 Sidebar menu for Windows 7 article. 7. 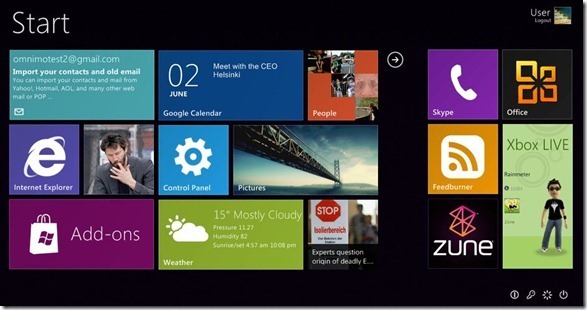 Windows 8 Lock screen for Windows 7: Another new feature of Windows 8. Windows 8 lock screen is pretty much similar to Windows Phone 7 lock screen. 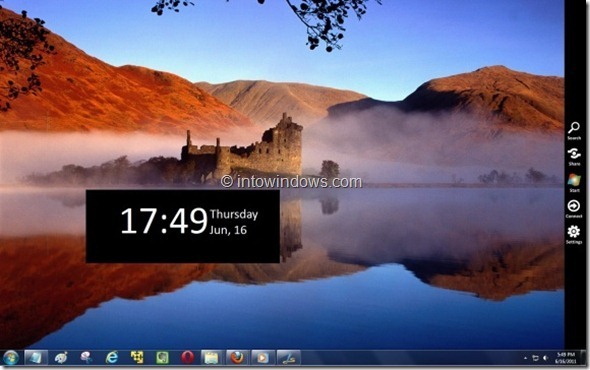 Read how to get Windows 8 swipeable lock screen in Windows 7 guide to get it. 8. Portable Workspace Creator: Windows 8 comes with a new tool named Portable Workspace Creator to install and carry Windows on USB flash drive. If you want to install and carry Windows 7 on USB, follow our how to install and carry Windows 7 on USB flash drive guide.